Margaret Thatcher or otherwise known as “The Iron Lady” is a little bit like marmite, people either loved or hated her. As part of my photography diploma application I had to photograph for a news article for an UK newspaper on the 13/04/13, between the pages of 2 and 6. This date happened to coincide to the over-saturation of articles about her and I decided to produce a photograph dedicated to Margaret. Instead of following politics I prefer trying to see rainbows and look out for unicorns and fairy dust, hence why I did not have a solid opinion of her. I wanted to portray the reaction of her death as neutral as possible. The scene may represent a celebration of her life or death. The vividness of the grass and the blue flowers outlining our protagonist represents new beginnings and life itself where as the over indulged motionless body next to the empty bottles of alcohol represent death. During this shoot, my model Joel and I were mobbed by curious teenagers and found ourselves explaining what we were trying to do to our hardest critics. I did get into the college by the way and I am very excited to start on 17th September 2013! 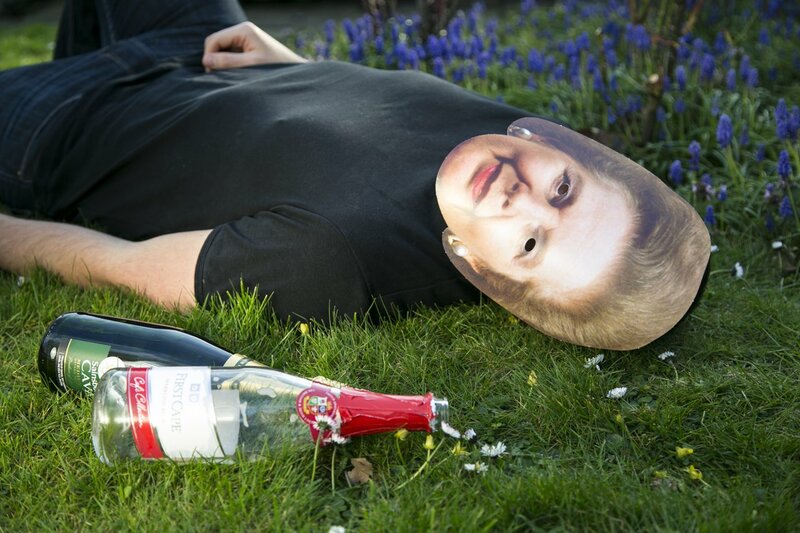 This entry was posted in blog, People and tagged celebration of death, celebration of life, iron lady, kensington and chelsea college, life and death, Margaret Thatcher.